“No Warning. No Escape.”, says Paul W.S. Anderson’s new film poster. If there was a warning before the film I would have run as fast as I could and looked for the escape exit. The new production of The Three Musketeers’ creator is entitled Pompeii, and tells the story of slave-turned-gladiator Milo (Kit Harington) who finds himself in a race against time to save his true love Cassia (Emily Browning). Kiefer Sutherland gives a decent performance as corrupt Roman Senator Corvus, Cassia’s betrothed and the antagonist Milo must overcome as Mount Vesuvius erupts and Pompeii crumbles around him. Paul W.S Anderson has never shown himself to be a great cinematic filmmaker. He is an artistically uninspiring director who, from time to time, is able to craft good entertainment. When it comes to Pompeii, however, the poor quality goes hand in hand with gaping from boredom at the screen. Since the eruption of the volcano itself was less than exciting, the writers: Janet Scott Batchler, Lee Batchler and Michael Robert Johnson, enriched the plot with the love story between Milo and Cassia, which, in my opinion, hardly remedied the situation. A lack of passion and chemistry between both the characters and their actors, coupled with there being nothing interesting or engaging about the relationship, left me feeling cold. This was exacerbated by Kit Harington’s acting, which was poor in a way that speaks of unsuitability. Being Jon Snow on Game of Thrones suits him very well. Being a gladiator? Not so much. Emily Browning’s performance was okay, but somehow felt forced. The actual explosion of the volcano happens all too late. The pace of the film goes wrong. Instead of showcasing the various forms of destruction, the director treats it as a mere background to the history of Milo, Cassia, and Corvus, and what it does show is disappointing. Great flood waves, flying rocks, clouds of dust, and a sea of molten fire are only computer modified accessories that barely deliver on the previously implied promise. Despite the reported cost of $90 million the picture fell through as a boring and cheap, artificial production. I might have been impressed with these effects in a video game or on TV. On the big screen, unfortunately, they didn’t impress me at all. It often seems like the writers of Pompeii didn’t pay enough attention while writing the script. 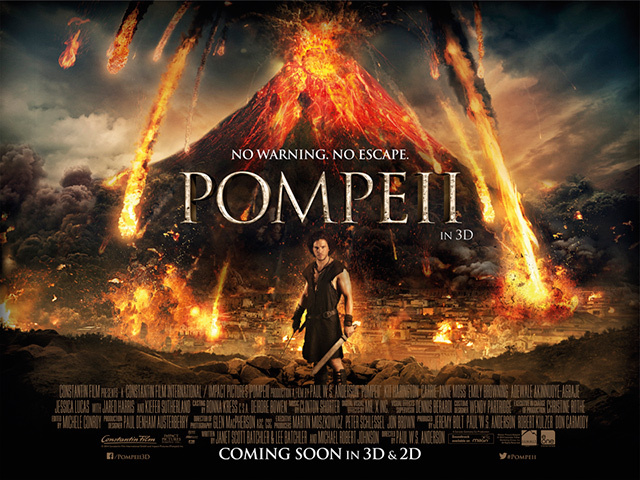 As a result Pompeii resembles Conan the Barbarian, Gladiator and the TV series Spartacus, and an outcome that is easy to predict. Suffering from the lack of its own originality, Pompeii is exposed as a computer tracing, an artificial and under developed project. The only thing that kept me interested in the film was the score composed by Clinton Shorter. It was sad to see Kiefer Sutherland, Adewale Agbaje (Atticus), and Carrie- Anne Moss (Aurelia) in such a weak film. I have always thought of these actors as talented individuals, but Pompeii proved to be both a waste of their talent and a movie where they decided not to waste any by using it. I hope they never take roles in such a movie again.